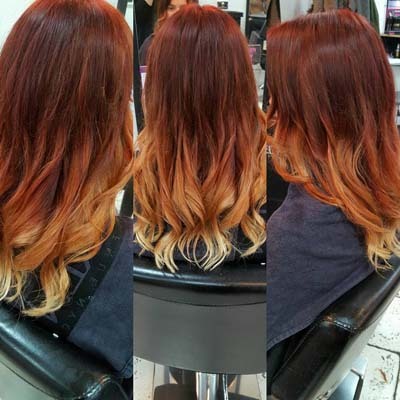 Why Ombre Hair is the way forward in hair colour! Fed up of having to colour your roots every few weeks? Does your hair look dated and old? Is your hair crying out for a colour transformation? If the answer is YES, then Ombre Hair could be just what you are looking for! Ombre is the subtle melt of colour from the root area to the ends creating a faded grown out chic style. A client can choose one to three Redken colours to shade for the Ombre effect. In warmer months aim for lighter more vibrant shades, and in winter months choose cooler more ash tones. You will need to have parts of your hair lightened but don't worry about hair damage or breakage as the Redken PH Bonder allows you to have glam Ombre whilst maintaining bond integrity leaving your locks luxuriously soft. For dark brown/chocolate hair try deep reds, coppers, and cool ash. For caramel hair try rich browns, coppers, possibly even violet or silver. For fairer hair try ash tones, subdued blondes, golden caramel tones which will add warmth to olive skin. If you think your hair is too short for fun Ombre colours then try the Balayage effect; a grown out highlight keeps everyone stylish and happy. It doesn't matter what length your hair is a Balayage is achievable. Get in touch with us today to speak to an Ombre stylist about how we can put life into your hair! Be Bold, Be Beautiful, Be Adhara!